Can Anyone Stop The "Terror Squad"
The 7th Grade Division of the Tip Off Classic is by far the most talented and stacked. This bracket will surely let us know who the top team in the region is. 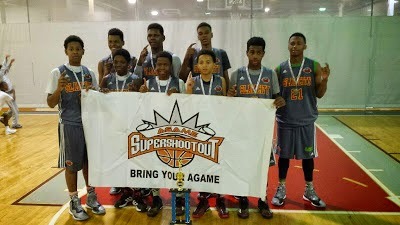 Slam City Elite: Yes, the Terror Squad will be in the building and will be making their march towards history. No team has ever traveled the Basketball Spotlight circuit undefeated but they could be the first. They possess the most powerful line up in the country with all 5 starters in our national top 20 (Isaiah Todd, Jordan Toles, Tyler Brelsford, AJ Hoggard, and Cameron Byers). They would have to be the overwhelming favorite. PSA Cardinals: This scrappy bunch feature a strong quartet of players (Andre Washington, Tysheem Pickett, Brandon Weston and Jaylen Murray). They have battled with the Terror Squad on a few occasions and are ready for another shot. They have a very good chance of winning it all. Gauchos: The Choz finished #5 in America and have grown accustomed to wining with this group. Point guard RJ Davis is currently ranked #21 on our national list and can change a game single handily. You also have to throw in DJ Bailey and CJ Robinson. If these boys get hot they could take the championship back to the Bronx. RJ, DJ and CJ AKA the "Alphabet Boys". Team IZOD: Smooth scoring guard Shane Dezonie returns is now joined by newcomers Austin Allison and Demon Clowney. Point guard Richie Greaves will be running the show for Reggie Carter’s crew. They are positioning themselves to make a strong run for the championship. Havoc City Elite: The DMV squad is coming in featuring Dimigus Stevens and Marcus Dockery AKA The Splash Brothers. These are two of the top shooters in the country and you can also throw in one of the most versatile forwards Jahmal Banks. Team Final: Xavier Pina has moved over to Team Final and that gives them a legitimate scorer from the perimeter. He isn’t afraid to launch it from the cheap seats. Hopefully they have some other pieces that can help them get over the top. Philly Triple Threat: PTT comes in with a solid group led by Brandon Campbell, Nair Pettigrew, Manir Waller and Marvin Harrison. This is our first time checking them out and we are very curious. Boston Titans: The Boys from Bean Town made some noise on our circuit last year. Now they return with the dynamic backcourt of Kurtis Henderson and Jamel Shaheed. They have never been the type to back down and we don’t expect them to start now. NY Rens: Rens Director/Coach and middle school guru Billy Council is back with a fresh batch. Right now his go to guy is Jaheim Young but knowing Council he has others in his arsenal that he is keeping quiet about. The Rens always bring something new.